A class leader when it comes to ride and handling, the 2006 Ford F-150 is dragged down by its excessive weight and lack of key safety features. A limited-edition Harley-Davidson package debuts this year, featuring monochromatic paint, 22-inch alloys, unique trim and special leather seating. New 20-inch alloy wheels are available on FX4, Lariat and King Ranch models. Satellite radio is newly available, and traction control can be added to 2WD V8 models. Later in the model year, the crew cab can be equipped with a 6.5-foot cargo bed. Exceptional ride and handling characteristics, attractive and functional interior designs, multiple cab and bed configurations. Over the last several decades, Ford's F-Series truck has gone from farm implement to fashionably hip, bringing home numerous sales records and big profits in the process. With total sales each year approaching one million units, it's hardly a stretch to call Ford's big pickup the single most important model it makes, and when it comes time for a redesign, there's little room for error. To keep competitors at bay, Ford gathered its best engineers, cranked up the focus groups and set out to design the most advanced F-Series ever built. The result was the 2004 Ford F-150, a thoroughly modern pickup with a cleaner-burning and more powerful V8, increased passenger and cargo room and broad-shouldered bodywork that looked the part of an all-American pickup truck. New features were added throughout the vehicle, many of which were firsts in the segment. All body styles had four doors; extended cabs (SuperCabs in Ford truck terminology) could be had with a shorter bed for easier fits in tight garages and crew cabs (SuperCrews) provided more passenger room than ever before. This recipe proved quite successful, and the Ford F-150 carries on this year with minimal changes. Get inside one of these half-ton pickups and you'll barely know you're in a truck thanks to a modern interior design that effectively blends functionality and style. Multiple trim grades allow you to choose work-truck simplicity or luxury carlike pampering. A fully boxed frame not only adds stiffness, it allows for a more precisely tuned suspension and a smoother ride, versus previous-generation F-150s. 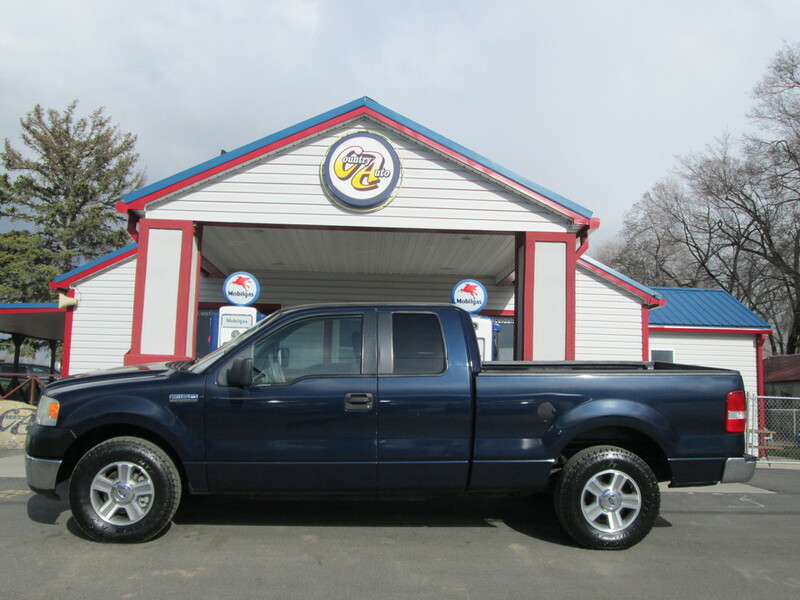 Whether you use your pickup truck like another trusty tool on the job, or you just need a versatile vehicle that can haul the family and a load of lumber, the 2006 Ford F-150 is sure to have what you're looking for. The Ford F-150 is available in three body styles (regular cab, extended cab and crew cab), three bed lengths (5.5-foot, 6.5-foot and 8-foot) and five different trim levels (XL, STX, XLT, FX4 and Lariat). Both regular and extended-cab trucks come standard with reverse-opening rear doors for easier cab access. The base XL is your standard work truck with a vinyl or cloth interior and minimal amenities. The STX is similarly equipped but adds body-colored bumpers, sportier wheels and a few additional features, such as a split bench seat and an upgraded sound system. The volume leader in the lineup is the midgrade XLT, as it offers the widest array of available options, as well as an upgraded interior, chrome trim, and power locks and windows. The FX4 is geared toward off-road enthusiasts as it includes underbody skid plates, retuned springs and heavy-duty shocks, as well as 18-inch wheels and an upgraded interior. Top-of-the-line Lariat models cater to buyers looking for an upscale look and feel with interior features like brushed aluminum and wood highlights, leather seats, a trip computer, 18-inch alloy wheels and automatic climate control. The King Ranch package adds unique interior and exterior trim, exclusive leather seating and wood grain interior accents. The Harley-Davidson package includes monochromatic paint, 22-inch alloy wheels, unique trim and black aniline leather seating. There are three engine choices on this Ford truck: the standard 4.2-liter V6, a 4.6-liter V8 and an optional 5.4-liter V8. The 4.2-liter V6 makes 202 horsepower and 260 pound-feet of torque. The 4.6-liter engine provides 231 hp and 293 lb-ft of torque, while the 5.4-liter V8 produces 300 hp and 365 lb-ft of torque. Both V8 engines are matched to four-speed automatic transmissions. The V6 gets a standard five-speed manual. Properly equipped, the Ford F-150 can tow up to 9,900 pounds and carry 3,020-pound payloads. Four-wheel antilock disc brakes are standard across the board, and traction control is optional on 2WD V8 models. Unlike some of its competitors, the F-150 does not offer side airbags or stability control. Frontal impact testing by the NHTSA resulted in a perfect five-star rating. In offset-frontal crash testing conducted by the IIHS, the Ford F-150 earned a rating of "Good," the highest available, and a "Best Pick" designation. FX4 and Lariat models with bucket seats use a floor-mounted shifter, while all other configurations have a standard column shifter. An optional overhead console uses interchangeable modules so owners can add whatever features they find most useful. Regular cab F-150 models have handy reverse-opening access doors for getting to the storage area behind the seat. Thanks to a stiff frame and rack and pinion steering, the 2006 Ford F-150 delivers impressive ride and handling for a truck. Excessive weight bogs down the 4.2-liter V6 and 4.6-liter V8 engines, so upgrading to the 5.4-liter V8 is a must.